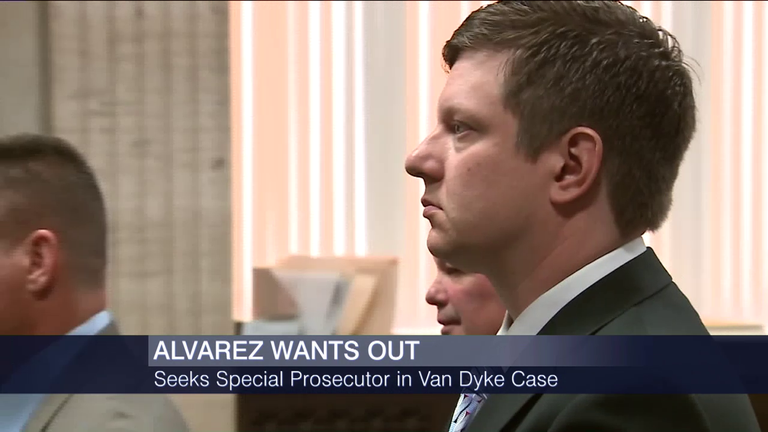 A surprising development on Thursday in the prosecution of Jason Van Dyke, the Chicago police officer who is charged with the murder of Laquan McDonald: Cook County State's Attorney Anita Alvarez recused herself and her office from the prosecution. It's a move that pleases protesters and advocates who believe the state's attorney's office has a conflict of interest. Alvarez, who has been widely criticized for her handling of the case, asked the judge to appoint a special prosecutor. She charged Van Dyke with murder in the shooting death of 17-year-old McDonald some 400 days after the incident, and has faced questions as to why charges were not filed sooner, given the release of a video that refutes the initial accounts of the case, that McDonald had been lunging at and a threat to police officers. Activists have called for a special prosecutor not only because of Alvarez’s handling of the case, but because they believe the office has too close a relationship with the police to effectively prosecute such shootings. Kim Foxx, who defeated Alvarez in the Democratic primary in March, agreed. And it’s because of the pending turnover in the office that Alvarez says she should be replaced on this case, as outlined by one of her assistant prosecutors in a court hearing Thursday. “State’s Attorney Anita Alvarez has taken the position that, although there is no conflict of interest which would require her removal from this case, she has asked to recuse herself, as is her right, and has asked your honor to appoint a special state’s attorney in her stead,” said Assistant State’s Attorney Alan Spellberg. “While it is has not been an easy decision, I believe that it is the right one because it will help to avoid unnecessary legal delays and provide continuity in the handling of this very important and complicated case. It would also ensure that one designated prosecutor will handle this case as it proceeds to trial. “I will not apologize for doing a very thorough, meticulous investigation,” Anita Alvarez said about the Laquan McDonald case on “Chicago Tonight” in December 2015. The judge says he’ll look into the matter before making ruling on June 2. This was prompted in part by petitions from the People’s Law Office and MacArthur Justice Center, as well as Jesse Jackson’s Rainbow Push coalition. “While there is no legal conflict of interest that would prevent the State’s Attorney’s Office from continuing the prosecution of this case, I believe that the results of the recent election and the impending transition of this office make this the best and most responsible decision,” Alvarez said in a statement. March 15: Cook County State’s Attorney Anita Alvarez lost her bid for re-election to Kim Foxx in a race that was widely seen as a referendum on her handling of the police shooting of 17-year-old Laquan McDonald. March 10: The Democratic candidates running for Cook County State's Attorney joined us in their final appearance together before Tuesday's primary. The high-profile race comes as faith in the criminal justice system has been shaken not only in Chicago, but also in cities across the nation. Feb. 16: Sixty days: That’s the maximum amount of time Chicago Police should take before allowing the public to see recordings or reports of police-involved incidents. The recommendation from the Mayor's Police Accountability Task Force comes on the same day as a group of attorneys and elected officials calls for a special prosecutor in the case that led to the death of 17-year-old Laquan McDonald. Nov. 27, 2015: Complete coverage from “Chicago Tonight,” including interviews with activists and officials on the shooting death of the 17-year-old in October 2014.